Safe care at the end of life involves much more than just prescribing for end-of-life symptoms. An approach of whole person care is one in which respect for the individuality of the dying person is fundamental, and this can sometimes present real challenges for clinicians. Diagnosis of dying is a key clinical skill, and the use of triggers can assist clinicians to recognize patients who are likely to enter the terminal phase soon. Early recognition creates the opportunity to plan care and to share decision-making about goals of care with patients, allowing more choices about how and where the dying person may wish to be cared for. Common symptoms at the end of life include pain, nausea, respiratory secretions, dyspnea, agitation, and delirium. Prescribing for the end of life involves, on the one hand, ceasing unnecessary medications and interventions and, on the other, providing and using comfort medications appropriately and effectively. 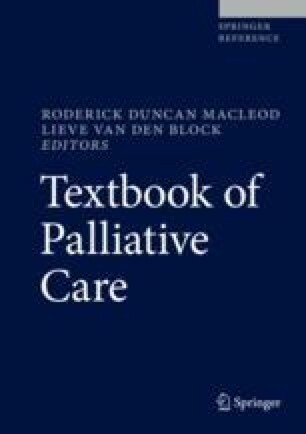 Psychosocial care of the dying person focuses on their personal and spiritual needs at the end of life. Decision-making about what interventions are appropriate at the end of life is based on weighing up the likely benefit versus the burden of such interventions, assessing this in the context of the patient’s prognosis. Decision-making at every stage must include the dying person as much as they are able and wish to, as well as their family and close supporters. It is therefore essential that clinicians are able to communicate comfortably and empathically about end-of-life concerns. Neuberger J. More care, less pathway. A review of the Liverpool care pathway. London. 2013. https://www.gov.uk/government/uploads/system/uploads/attachment_data/file/212450/Liverpool_Care_Pathway.pdf. Accessed 15 May 2017.